Bhutan Tour – 4 Days & 3 Nights is designed for Indian Traveler who wishes to enter and exit Bhutan via Paro International Airport. Bhutan Tour via Paro Airport for Indian traveler will take you through the mystical valleys of Bhutan is an ideal introduction to the Dragon Kingdom. Experience Bhutanese hospitality, admire the ever-changing landscapes, and immerse yourself in Bhutan’s rich Buddhist culture. 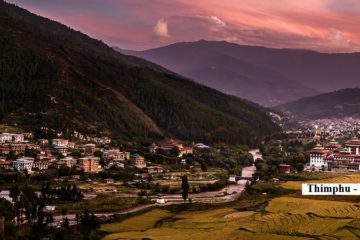 During the 3 nights Bhutan tour, you will cover places like Thimphu and Paro, including some half day hikes to Tiger’s Nest, Tango Cheri Monastery in Thimphu and some cultural heritage sites. Twin sharing room. All private excursions and transfers. Accommodation, 3 Star Hotel Flight Tickets. When you arrive at the Paro International airport, our guide will meet you and drive you to Thimphu, (Approx 1hr 30 min) to the capital of Bhutan. After checking in at the hotel, we will head for the Buddha Dordenma Statue, which is made of bronze and gilded in gold one of the largest sitting Buddha in the world . We will visit the Takin Sanctuary (a goat-antelope) was declared the national animal of Bhutan because it is strongly associated with the country’s religious history and mythology. From there we will visit the Zilukha Nunnery and the Bhutan Post Office Headquarters & Postal Museum Here you can have stamps made with your own photo images on the stamps and go back in time of the postal era. Today’s last destination is the Thimphu Dzong (Trashi Chhoe Dzong), the largest religious building in Thimphu which also houses the offices of the King and the offices of the Bhutan’s Central Government. Conclude the day’s sightseeing with visit of Trashichhoe Dzong, or ‘the fortress of the glorious religion’. This is one of the most impressive buildings situated along the right flank of the Thimphu river built in 1641 by Zhabdrung Ngawang Namgyel. This impressive fortress/monastery houses Secretariat building, the throne room of His Majesty, the King and various government offices. After breakfast excursion to Taktshang Monastery (approx. 5 hours round trip walk). 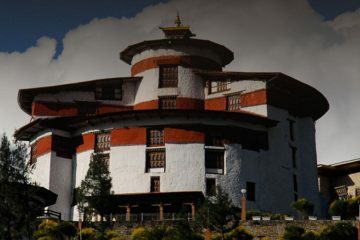 It is one of the most famous of Bhutan’s monasteries, perched on the side of a cliff 900m above the Paro valley floor. This site has been recognised as a most sacred place and visited by Zhabdrung Ngawang Namgyal in 1646 and now visited by all Bhutanese at least once in their lifetime. The hike to the monastery makes a splendid half day excursion. En route also visit Dzongdrakha temple. Often called as mini Taktsang, Dzongdrakha is a cliff-side temple complex on the western side of Paro valley. Local oral tradition states that when Guru Rinpoche first came to Bhutan, he came from Nepal, first landing at Drakarpo, and then Dzongdrakha before arriving at Taktsang (Tiger’s Nest) farther north up the valley. Afternoon visit Ta Dzong, originally built as Watchtower, which now houses National Museum. The extensive collection includes antique thangkha paintings, textiles, weapons & armour, household objects and a rich assortment of natural and historic artifacts. Then walk down the trail to visit Rinpung Dzong, meaning (“fortress of the heap of jewels”). Along the wooden galleries lining the inner courtyard are fine wall paintings illustrating Buddhist lore such as four friends, the old man of long life, the wheel of life, scenes from the life of Milarepa, Mount. Sumeru and other cosmic Mandala. After breakfast, transfer and departure from Paro airport.